Information for Grocers | Employee Gifts from gThankYou! gThankYou Gift Certificates are Manufacturer Coupons that have built-in safety features for easy retailer validation. The safety features are printed along the bottom front of the coupon. Coupons are printed on light grey safety paper. Along the right edge of the coupon are pink circles with the letter “g” in them. These are heat sensitive. Hold the coupon close to your mouth and breath on the pink “g”’s as if you are fogging a mirror. The warmth of your breath will make the pink “g”’s disappear. They reappear when cool. On the back-side of the coupon, use a coin to scratch any white/unprinted part of the coupon; you will see the embedded watermark darken. The watermark images are the letter “g” from our logo. gThankYou Coupons are printed on light grey safety paper. If a coupon is photocopied, it will usually show “VOID” on it. 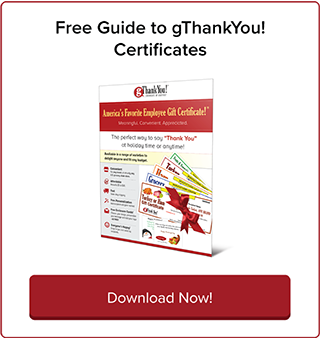 Click here to download a PDF of gThankYou Coupon Safety Features for Front-End Managers and Cashiers. If you are concerned you have a photocopied or fraudulent coupon, please call gThankYou at 888-484-1658. Please instruct Cashiers to honor all valid gThankYou Manufacturer Coupons. The coupons are coded to be price required, so the Cashier must enter the correct value after the barcode is scanned. Coupons are valid up to and including the maximum value and only valid for the merchandise specified. Consumers are responsible for taxes, if any. If the consumer spends less than the maximum value of the coupon, they do not receive change; if a consumer spends more than the maximum value, they pay the difference. The value of the purchase must be written in the box on the back of the coupon. Submit gThankYou Coupons to your coupon clearinghouse as you would any other Manufacturer Coupon. Your company will be promptly reimbursed. gThankYou’s clearinghouse is Inmar, one of the largest Manufacturer Coupon clearinghouses. If you do not have a coupon clearinghouse, or wish to bypass yours, submit redeemed coupons along with an invoice to the Inmar address on the back of our coupons. If you have billing questions or wish to set up a clearinghouse account, call the Inmar Retailer Hotline: 800-285-7602 during business hours (Eastern Time). 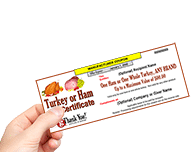 gThankYou, LLC guarantees retailer reimbursement for all valid gThankYou Manufacturer Coupons redeemed by the expiration date. If you would like to receive our detailed Retailer Guide with images of gThankYou Coupons and additional details, call gThankYou: 888-484-1658.